Geopathogenic Zones: Would You Sleep with a Poisonous Snake in Your Bed? I’ll bet most of you wouldn’t even think of it. But that is exactly what a large number of you are doing every night. Only this type of “snake” has a slow-acting poison. The snake is formed, among others, by underground streams of water that throw up walls of microwaves and other types of radiation which can cross your bed, forming a geopathogenic zone. A geopathogenic zone can be located in the region of your head, causing insomnia, a brain tumor, learning problems, Parkinsons, etc. ; over your chest, causing asthma, pneumonia, breast cancer; across your abdominal region, causing cancer of the stomach, liver or pancreas; in the region of your pelvis, producing infertility, prostate cancer, malformed babies, etc. But, you’ll say: “Why haven’t I heard about this in the media?” But, now you have. Probably because these zones are invisible, although air is too. Actually, this phenomenon has been extensively investigated by unbiased investigators for more than a hundred years. Books have been written about geopathogenic zones in many languages. Architects in Germany learn about this at the university to be able to create healthy living spaces. And the Chinese knew about it since millennia, calling it The Claw of the Dragon. The ancient Romans would graze sheep for a year in an area where they were considering estate development. At slaughter time, they would examine the sheep’s livers. If many livers were diseased, they would not build in that area—you guessed why. The Bavarians of Germany would place an anthill in the future bedroom area of a house to check the area’s suitability for healthy life. If the ants were still there after a while, they would not build the house—ants love geopathogenic zones. Your child also knows about geopathogenic zones. Babies will cry if they sleep in one. They will move to the side of the crib that is less affected. When older, they will run to your bed, or their sibling’s, to escape from their own bed—or fall on the floor and continue sleeping there, even sleepwalk to get away. Maybe that’s why your child always catches a cold, has asthma and allergies and/or doesn’t learn well in school—although other reasons such as vaccination side effects could be given. Animals also know about geopathogenic zones. Cats love to sit in them. They soak up this type of energy. Dogs avoid geopathogenic zones. They won’t sleep in a doghouse if it’s affected by such a zone. Bacteria also love geopathogenic zones, the energy of the zone increases their ability to multiply—inside your body if you happen to sleep in such a zone. Bees, wasps, ants and—you guessed it: snakes—thrive on geopathogenic zone energy. Bees will produce much more honey in geopathogenic zones (worth knowing for beekeepers). Ants will build their hills there. Some fish dislike geopathogenic zones, seen in a case where goldfish would only stay in the part of the aquarium where there was a neutral zone. Perhaps other fish have different likes. Plants are also in the know. Among those that like geopathogenic zones are: oak, willow and fir trees. Those that have a difficult time of it include: apple, pear, and peach trees. Geopathogenic zones cause affected trees to bend in odd directions to avoid them, grow large tumors and produce little or no fruit, even attract lightning under the right circumstances. Solid materials are also affected by geopathogenic zones. Walls produce cracks and humidity, roads have frequently repaired potholes that don’t seem to go away. Spontaneous combustion can occur in hay or other combustible materials if they are located in a geopathogenic zone. There are statistics which show that accidents occur more frequently, especially head-on collisions, at certain places along highways where such geopathogenic zones cross the road, disrupting the driver’s concentration. In some countries traffic authorities have placed signs warning people to reduce their speed before the road crosses a geopathogenic zone. 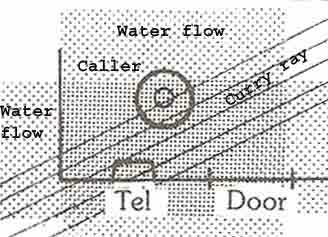 A stream of water flowing underground below your bed throws up a wall of microwaves and other radiation rising to considerable height. This can be measured with instruments. The stream might be 50 meters below your bed, or much more. There are many subterranean streams, even rivers, in most places. The thickness of such geopathogenic zone walls varies depending on the width of the stream, maybe it covers your whole bed or more. Then you would be sleeping immersed in a geopathogenic zone. You would wake up tired in the morning, might suffer from insomnia to boot, and be prone to catch the flu, and more serious illnesses after your energy has been sapped by sleeping in that bed for some time. Solution: change the position of the bed. The Hartmann grid consists of naturally occurring charged lines that run magnetically North-South (approx. 2 m apart) and East-West (approx. 2.5 m apart) all over the planet, like latitude and longitude lines on a map. They rise from the ground like invisible walls about 20 cm thick, penetrating buildings up to a great height, and form a network that spans the Earth. The intersections of these lines, or walls, are what cause problems. Curiously, I have observed that the thickness of these Hartmann lines increases up to several meters before an earthquake takes place somewhere in the world. After the earthquake, they return to normal. 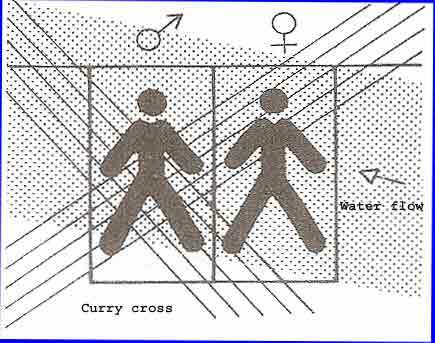 The Curry grid consists of similar lines, but they run diagonally to the Earth’s poles. They are spread about 4 m apart with a width of about 0.5 m, forming another network that spans the Earth diagonally. Here again, it is the intersections that cause problems. Curry lines cause nervousness. Electromagnetic radiation emanates from fault lines, which can have a negative effect on your health, especially in combination with the abovementioned zones. Underground streams that pass by cemeteries before flowing under a house or apartment building have been found to be particularly lethal as regards cancer. There are other factors, among others, mineral deposits, subterranean caverns, and ley lines. The more geopathogenic zone factors that cross your bed, the more intense the geopathogenic zone will be and the more severe will be your symptoms and illnesses—and the more rapidly they will appear. Any one of these factors is capable of producing cancer. With several of these factors combined, the pathogenic effect is greatly multiplied. You wake up unrefreshed in the morning, may have insomnia or nightmares. You may be very nervous. During the day you have a lack of energy. You will eventually develop more severe health problems after a period of time, the length of which depends on your vital force. Nausea, vomiting. Abortion, premature birth. Difficult birth. Malformed offspring. Babies with health problems. Children will try to avoid going to bed, leave it at night and possibly sleep in odd positions. They do poorly in school, may play hooky, develop allergies and frequent illnesses. Your cat’s favorite place will be a crossing point of underground streams. Your dog will avoid such points like the plague. There are likely many ants or other insects to be found in parts of the house with geopathogenic zones, also wasp hives. Any tree bending in odd directions or growing large tumors are located in a geopathogenic zone. They will bear little or no fruit. Hedges stunted as if something crossed its path. Withering pot plants can be in the middle of a geopathogenic zone. Cracked walls, humid areas in basements indicate geopathogenic zones. A tree that has been struck by lightning is likely to be growing on a geopathogenic zone. Lightning has been found to strike where there are two or more underground streams crossing at depths that are some distance apart. 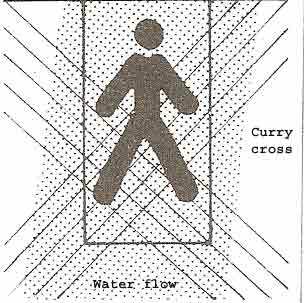 Note: In the following cases the investigator, Käthe Bachler, only noted the presence of Curry lines and water flows. The Hartmann grid and other geopathogenic zone factors mentioned above were not taken into consideration. In many of these cases, the presence of such additional factors would proportionally worsen the situation presented. This was a ten year old slow learner, who took a very long time to carry out tasks, such as cleaning the blackboard. Changing the bed position to the one shown greatly improved the situation. She was sleeping on a geopathogenic zone where a Curry cross intersected a water flow. Case 2 – The most troublesome child in the class. She would not pay attention, interrupted the class, was very nervous and fidgety. After being moved to another desk, her behavior improved considerably. 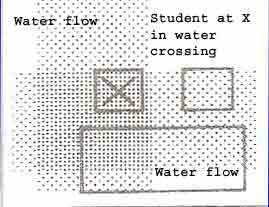 Her desk was placed right on a geopathogenic zone with a water crossing. This is an argument for moving students around every few weeks to avoid prolonged exposure to geopathogenic zones. Case 3 – This woman suffered considerable weight loss and two abortions. She was sleeping on a Curry cross and microwave radiations from a subterranean water flow. Note the geopathogenic zone with a triple intersection extending from the waist down. The wife said that the husband was aggressive and always in a bad mood. He was the one who asked for a divorce. The wife suffered from terrible pains all over her body, a severe depression and a nervous disorder. The husband was sleeping on a geopathogenic zone consisting of a Curry cross intersected by a subterranean water flow. The wife was sleeping on a Curry line crossing a water flow. Case 5 – A man who died of bone cancer at the age of 45. This man didn’t drink or smoke, but was sick all the time. He was hospitalized, given stomach surgery and confined to his bed. He developed bone cancer and died after having slept in this bed for thirteen years. He was sleeping on a geopathogenic zone consisting of a Curry cross as well as a water cross. 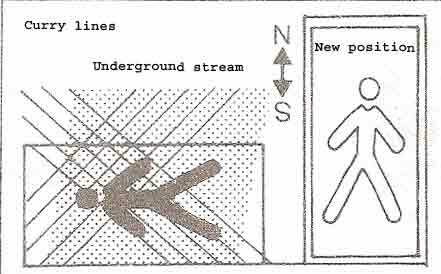 An underground stream was flowing from the top of the diagram to the bottom. Another was flowing horizontally at the level of his legs. 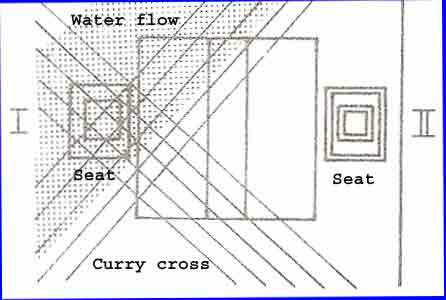 Seat I on the left was afflicted by a geopathogenic zone with a Curry cross and a water flow. Teacher A taught for ten years from this chair and suffered two heart attacks. Teacher B taught for four years and suffered a nervous breakdown. Teacher C taught for one year, complaining of feeling cold and having a general lack of good health. Teacher C then moved to seat II and reported that he no longer felt cold and that he had been in the best of health since. Teacher D had taught from seat II for four years and had enjoyed the best of health. This spot was afflicted by a geopathogenic zone with a single Curry ray and a water crossing. Three people suffered fainting spells while using the phone, one died instantly. Two of them were carried away and regained consciousness. 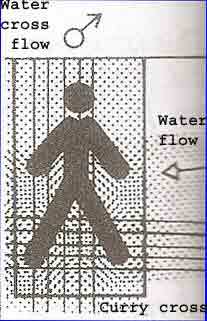 The figure shows a stable crossed by subterranean water flows. At the point of crossing there was a sick cow. Previously that year a pig and some chickens had died mysteriously in the pens shown with a water flow 50 meters below them. The other pens had no history of sick animals. This is a procedure developed by the German doctor Hartmann, who discovered the Hartmann lines. It consists of measuring your skin resistance at half minute intervals over a period of 20 minutes while lying in your bed. A graph is then drawn from the readings, the profile of which will indicate a geopathogenic zone disturbance or not. If the graph remains horizontal without irregularities, the bed is safe to sleep in. If the graph is irregular and has a rising trend, the bed is a geopathogenic zone. Move it to another location and check again. Below follows the simple procedure. You can carry out the procedure yourself or have an assistant help you. You can download the detailed procedure from the link below, adapting it to your situation. Important. Before doing the test you will have to remove all sources of electrosmog in the room. Basically this means unplugging all the electrical devices in the room, shutting off all mobile phones and WiFi devices in your house or apartment. Make sure you pull out all the plugs of all electrical equipment from the sockets in your room, otherwise there will be interference with the measurements and you will get an inaccurate result. Earth Rays, Adapted Käthe Bachler diagrams used with permission from the current copyright holder John Living www.in2it.ca. Kjetill Oftedal, a Norwegian by birth, physicist, systems analyst and homeopath by education, multilingual at an early age--a result of being raised in the U.S., Norway and the Dutch West Indies--has lived and worked in various professions in a number of European countries and the U.S.
Kjetill Oftedal has worked as a sailor, salesman, night guard, electrical engineer, North Sea offshore engineer and in the Sahara; tutor, high-school, adult education and university teacher; director of personal enhancement training institutions in Spain and Portugal; systems analyst, computer programmer; classical homeopath, multilingual translator, webmaster, managing director of a school and clinic of classical homeopathy he established in Spain. While in Spain, he wrote a book on the subject of electrosmog--a much neglected and often purposefully ignored health hazard of the current technological civilization--for the Swiss company Smogly, and, lately, he has authored a book and web-based courses on classical homeopathy. Kjetill Oftedal is the author of "Family Homeopathy and Survival Guide," a practical self-learning book for household use, which he is translating into Spanish. Kjetill Oftedal has always been interested in the unusual, mystical and occult, leading him to write a number of esoteric short stories, some of which are published in "Nine Dewdrops," available from Amazon as a Kindle eBook. He lives in Caracas, Venezuela with his wife Xiomara, where he writes and runs the International Homeopathic Web Clinic and Avila School of Classical Homeopathy. Director of the International Homeopathic Web Clinic and the Avila Clinic and School of Classical Homeopathy in Caracas, Venezuela. Author of the e-book "Family Homeopathy and Survival Guide." Former director of the Iberian School and Clinic of Classical Homeopathy in Estepona, Costa del Sol, Spain and Gibraltar. Founding member of the Spanish Association of Classical Homeopathy (Asociación Española de Homeopatía Unicista) approved by the ECCH (European Council for Classical Homeopathy).